Since it is held on weekend, Mommy Jane brought Little Angels to attend ZooMoo event as they introduced their new App at DreamWorld Playland which located at the Starling Mall. I'm sure every children love to watch ZooMoo which is available on Astro, Ch 619. It is the world's first children's channel devoted entirely to the Animal World. My Little Angels enjoyed the show and we are eager to find out how the App works. ZooMoo is a fully interactive channel which has puppets, cartoons, games, music, puzzles and activities designed to create a unique television and educational experience for young viewers. The Channel was developed with the use of technology to help our children to explore the animal world in an entertaining, interactive and enriching way. The programme include the very popular Dinosaur Train and Malaysia made animation, Origanimals. The channel is complemented by a fully synchronized second screen application which is called as ZooMoo App. Through the App, viewers able to sync the app and automatically collect animals as they encounter on the TV screen and bring them to life on their tablet or smartphone. The ZooMoo App is synchronised to the broadcast by an acoustic watermark inaudible to our ears, but easily detected by the microphone on the tablet. When we turn the App on while watching the ZooMoo channel, the complimentary content is then sent to the tablet. Even when we're not connected to the channel, the App can still be used and my Little Angels could browse and explore the content they have collected. My Little Angels will able to collect over 160 animals to play as well as items which include the animal cards, animal sound effects, videos of animals in their natural environments and food cards for feeding animals with. The ZooMoo App is available for free on the App Store and Google Play Store. For more details, do visit their website at http://asia.zoomoo.tv and do like their facebook page at www.facebook.com/zoomooasia for latest information. 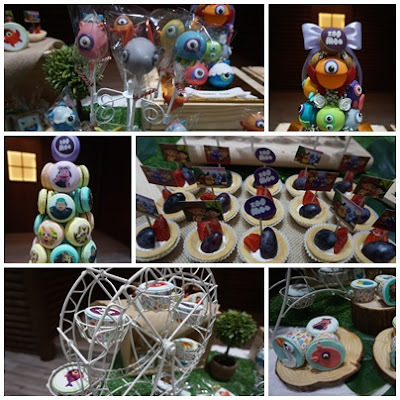 If you're looking for a venue to hold a birthday party for your Little Ones or for any corporate events, do check out DreamWorld Indoor Playland which located at the Starling Mall, Damansara Uptown and IOI City Mall. It is a healthy and safe environment where our Little Ones could learn through play, exploration, seeing and thinking which is good for our children's development, social and interaction skills. They specialise in parties, corporate events, group visit and event planning. Do pm them at their facebook page at www.facebook.com/dreamworldplayland for reservations or enquiries on the promotions available. It is great to explore a new educational App with my Little Angels on that day. They learned lots of things from the App on the names of the animals through the games and activities designed specially for them. They enjoyed their play at the safe and healthy environment and all the delicious food provided. The candy buffet with the ZooMoo theme attracted children and adults and within 5 minutes, everything gone. Thanks to ZooMoo and DreamWorld Playland for having us there and we truly enjoyed ourselves so much while exploring a new App on that day. Haneeza, it is indeed a good education App to help our kids out in their growing up period. wahh so cute, there lots activity our kids can play and learn. Rafzan, can help them too in their studies. Kanak-kanak zaman sekarang banyak aktiviti mereka masa cuti sekolah untuk zaman aku kecil2 tak ada pun hehehehe semua terjun sungai jer hehehehe..
Maha, me too. Children nowadays indeed very lucky to have all this. Amanda, agreed with you. They enjoy learning too. Lina, do bring your children here to enjoy. Goid for them and they will have art and craft too during school holiday time. Tak sampai lagi ke Starling Mall, eventhough dekat saja dengan office. Nowadays, ibubapa di KL ni memang akan bawa anak-anak di playland macam ni. Banyak aktiviti boleh dibuat dan selamat bawah pantauan keluarga. Bella, betul. Comfortable for both parents and children to explore. good! parents go shopping, kids can stay there main. Anak-anak mesti suka ni. Banyak aktiviti. Dee, memang suka. They learn from here too. warghh...banyak aktiviti menarik disediakan. Yang interaktif pun ada . Ni kalau ajak anak-anak Sal sure melompat nak pegi. Tq mommy sharing! hi mommy jane!bestnya dapat bawak anak-anak datang sini..banyak aktiviti boleh buat tu..
Sis Gee, betul. Bring your kids here too to enjoy this coming school holiday.